A multicolour edition of the bestselling My Calendar, this is a fun daily fabric calendar in English. Every day you can change the day, date, month, season and weather using hook-and-loop (Velcro) fabric pieces. 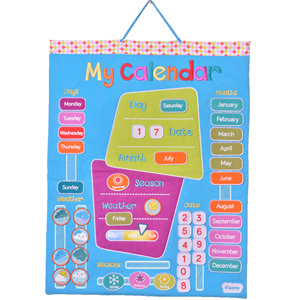 My Calendar - English fabric calendar is great for teaching vocabulary based on calendar, seasons and weather, as well as numbers and colours. This fun, tactile wall hanging also makes a beautiful wall display for a nursery, bedroom, playroom or classroom. Includes a handle / hanging loop. Really lovely colours. Looks good hanging up.